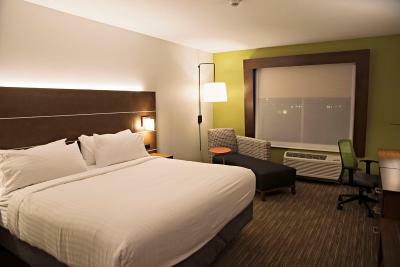 Lock in a great price for Holiday Inn Express & Suites - Rantoul – rated 9.1 by recent guests! The bed was very comfortable. Room was clean. Breakfast was very good. The woman who checked us in was very nice. We wanted to surprise my parents after they checked in by just paying their room and she made it easy for us to do that. The breakfast was great, eggs, sausage, biscuits and gravy, pancakes were awesome! Our stay was just wonderful. The breakfast was really good, the beds were comfy, everything was clean and bright. The friendly staff. I have stayed there on several different occasions and it's always been a wonderful experience. Rooms are clean. Bed comfortable. Breakfast Great variety and good. There were extra pillows and the room was spacious. Extras like bath and body shampoo and lotion were a nice touch. This is a brand new hotel, nicely decorated and comdortable. Holiday Inn Express & Suites - Rantoul This rating is a reflection of how the property compares to the industry standard when it comes to price, facilities and services available. It's based on a self-evaluation by the property. Use this rating to help choose your stay! 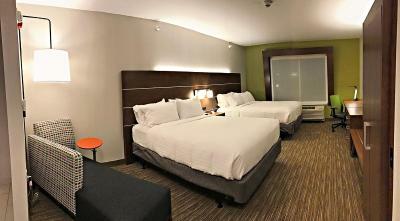 Holiday Inn Express & Suites - Rantoul in Rantoul has a spa & wellness center and a shared lounge. This 3-star hotel has air-conditioned rooms with a private bathroom. The property provides a 24-hour front desk and a business center for guests. The rooms are equipped with a flat-screen TV with satellite channels, a coffee machine, a shower, free toiletries and a desk. All rooms come with a seating area. Champaign is 16 miles from Holiday Inn Express & Suites - Rantoul. The nearest airport is University of Illinois-Willard Airport, 25 miles from the property. This property also has one of the top-rated locations in Rantoul! Guests are happier about it compared to other properties in the area. This property is also rated for the best value in Rantoul! Guests are getting more for their money when compared to other properties in this city. 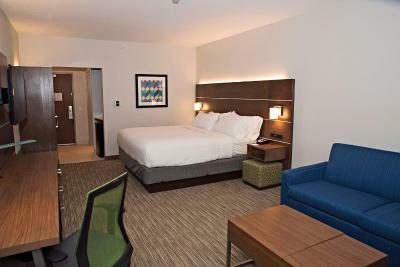 When would you like to stay at Holiday Inn Express & Suites - Rantoul? House Rules Holiday Inn Express & Suites - Rantoul takes special requests – add in the next step! Holiday Inn Express &amp; Suites - Rantoul accepts these cards and reserves the right to temporarily hold an amount prior to arrival. Holiday Inn Express & Suites - Rantoul accepts these cards and reserves the right to temporarily hold an amount prior to arrival. The price adjustments made were ridiculous. A little noisy from highway. Bathroom had some little bugs in it. Thermostat didn’t work. No half & half for coffee, facility was freezing. Breakfast was tasteless.